This represents '#pragma omp target' directive. In this example directive '#pragma omp target' has clause 'if' with condition 'a'. Definition at line 2311 of file StmtOpenMP.h. Definition at line 2355 of file StmtOpenMP.h. Definition at line 692 of file StmtOpenMP.cpp. 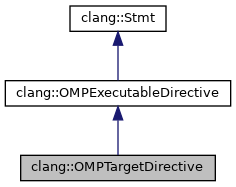 Definition at line 708 of file StmtOpenMP.cpp. Definition at line 2312 of file StmtOpenMP.h.